I stopped by at a local grocery store on my way back home to pick up something for breakfast. The idea was to wedge an oregano infused, golden brown double omlette inside slices of whole wheat bread layered in garlic and chilly-garlic mayonnaise. The ensuing breakfast was bearable, but the previous evening commerce gave me something to write about: the escalating prices of food in India. The egg at INR 3 per egg is a lot of egg in the face and the whole wheat bread leavened me with its INR 22 tag. I would recommend heading to the nearest kirana store, especially if you haven’t personally shopped for a while. I am sure the prices will shock you. Any crescendo that escalates at c15% per annum would. I am sure Humpty Dumpty would have an even mightier fall today than during the early 19th century when he/it was conceived as being perched on that wall. The reason is simple – eggs are dearer since poultry feed prices (corn, et al) are increasing fast both in local as well as international markets. And that may not bode well for companies like Godrej (Real Good chicken, sob sob) and Venky’s India Limited. Of course it is! But our preparedness to tackle the implication of that (i.e. a higher price level) may not be. The Deputy Chairman’s (of the Planning Commission) comment reminds me of a similar observation by the President of the United States (was it Clinton?) that countries like India should eat less! Here are some facts: per capita income in India has increased from 24,095 in 2004/05 to 43,749 in 2009/10 – that’s a CAGR of 13%. Agricultural productivity has lagged this rapid growth in incomes – growing at only 2% per annum. The large transfer of purchasing power via the Rural Employment Guarantee scheme has indeed ushered in a new found prosperity in rural India. In my native village, I never used to see the local folk eat vegetables and fruits. It was always variations of millets and pulses. They now have started to add variety to their cuisine, and as Mr. Ahluwalia says, what’s wrong with that? There is an expectation of rice prices coming down this year due to the copious amount of rainfall that we received this monsoon but that might be washed out too. 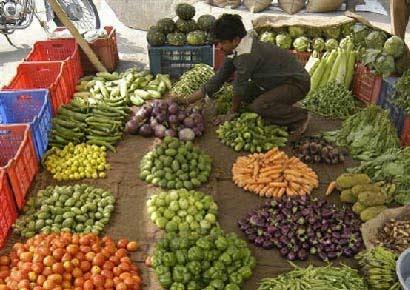 For since 2005, there has been a continuous rise in prices regardless of the monsoon. So what gives? It has to be basic demand and supply. If demand goes up and supply remains constant then the prices have to increase, right? How I wish our planners get this right – the re-rating possibilities for the fertilizer industry (if it can get it’s gas supply worries sorted! ), micro finance organizations, irrigation sector (Jain Irrigation, Yo!) would be significant. Our production is focused largely on basic food grains which are certainly not income elastic – i.e. one does not start consuming more rice or chapattis if one’s income rises. However, things like eggs, butter, fruits, vegetables, milk, meat etc are most certainly in greater demand if income rises. This will be difficult for someone from the industrialized world to understand, but in India, these food articles are aspirational to many. There are 370 million people currently in India living below the poverty. Forget an apple a day, even if they have consumed an apple in a lifetime till today, they’d be lucky. But all that will change and is changing…slowly. We need good old Keynesian artifacts in Indian agriculture, not RBI’s intervention. The focus should be on the Agricultural Ministry and not the Ministry of Finance. And while Shri Sharad Pawar remains overworked and occupied by the political flux in Maharashtra, I do not think he is the only one to blame. The reason for the rotting mountains of grain in the Food Corporation of India’s (FCI) godown is less a consequence of callous administration as much as it being a fallout of India’s federal structure of government. It’s a states of the Union vs. the Union issue. The center just cannot get the states to lift off the stocks – I do not know why but I can guess that it must be due to pricing issues. FCI’s hoards cannot be culled by a mere addition of storage capacity. That’s a long term process – the short term measure is getting trucks to line up at FCI’s godowns are carting the stuff away. At least Sonia Gandhi did admit that the responsibility of bringing down food prices is as much the responsibility of the center as it is of the states. The other important aspect is the cost of farming. In my village, a daily wage woman labourer was paid INR 50 a day to plant onion seeds. This year she is getting paid Rs.100. Male labourers are demanding INR 150. Just like the BPO industry, cheap labour that gave Indian agriculture its competitive edge is blunting rapidly. Cotton is another crop that is sown by my cousins in their farms. They are paying farmhands Rs4.50 for picking cotton this year, again double from last year. They tell me that the total labour cost for cotton has touched INR 15 per kilo this year. I can only imagine the plight of the farmland owners in rich Punjab and Haryana! This again comes back to the point – if a business has to start paying more per unit of labour then it needs to extract greater productivity per unit of labour. The fracas over the modest brinjal shows how arduous the path to this goal will be. Our farms need more mechanization, drip irrigation (Jain Irrigation, yo! ), better seeds, non-urea fertilizers and understanding politicians.